In the previous article of this series, we investigated the wetting of solids by liquids in terms of the Young Equation. Now we turn to one of the most utilitarian tools in thermodynamics and materials processing, the Ellingham diagram. I feel it is only fair to start off with a brief discussion about the man behind the diagram. Harry Ellingham was a British physical chemist, best known for his Ellingham diagrams, which summarize the empirically determined relationship of the standard Gibbs free energy of formation as a function of temperature for the oxidation and sulfidation of a series of metals. Ellingham first published this work in 1944 and the original application of his diagrams was in the field of extractive metallurgy. 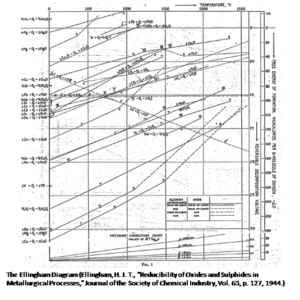 You will learn, in part 2 of this article, that the Ellingham diagram is useful for a wide variety of metallurgical applications. Ellingham was a Professor of Chemistry at the Imperial College of Science, Technology and Medicine in London, and was elected a fellow of the College in 1949. He was also a member of the Royal Institute of Chemistry and served as secretary from 1944-1963. In 1962, he received the prestigious honor of being elected as an Officer in the Most Excellent Order of the British Empire. We learned previously that the change in Gibbs free energy (ΔG) for a reaction is a measure of the thermodynamic driving force that causes the reaction to proceed. ΔG defines the ability of the system to do work at constant temperature and pressure. The enthalpy term (ΔH) is a measure of the energy liberated when the reaction occurs, or the “heat of reaction.” If the enthalpy is negative, the reaction gives off energy (it is exothermic). If the enthalpy is positive the reaction requires or absorbs energy (that is, it is endothermic). The entropy term (ΔS) is essentially the propensity for disorder in the products compared to the reactants. For instance, if a solid (an ordered state) reacts with a liquid (a little less ordered state) to form a gas (a very disordered state), there is normally a large positive change in the entropy for the reaction. Of course, T is the absolute temperature measured in Kelvin. For a reaction at constant temperature and pressure, the change in Gibbs free energy can be negative, positive or zero. If ΔG for the reaction is negative, not only is the forward reaction possible, but it is spontaneous. If ΔG is positive, the forward reaction is not possible, but the reverse reaction is and will occur spontaneously. Finally, if ΔG is zero, the forward and reverse reactions are in thermodynamic equilibrium and there is no net change in the free energy of the reaction. We can now define the free energy of reaction at standard state conditions as ΔGo, which is also called the standard state free energy of formation. This is the change in free energy that occurs when a compound is formed from its elements in their most thermodynamically stable states under standard state conditions. Standard state conditions dictate that the partial pressures of any gases involved in the reaction are at 0.1 MPa (1 atm), the concentrations of all aqueous solutions are 1 molar (or 1 mol/liter) and the ambient temperature is 298 Kelvin (25° C). The standard state free energy of reaction can also be calculated from the standard state free energies of formation. It is the sum of the free energies of formation of the products minus the sum of the free energies of formation of the reactants. The brackets in the equilibrium constant expression represent the concentration (or activity) of a given component, so that the equilibrium reaction constant (K) is defined as the ratio of the concentrations of the products over the reactants. For the case where a component is a gas, the quantity inside the brackets is the partial pressure of the gas. Note that if the equilibrium constant (K) is greater than 1, then lnK is positive, ΔGo is negative and the forward reaction is favorable. However, if K is equal to 1 then lnK is zero, ΔGo is zero and the reaction is at equilibrium. Note that mathematically, minus the natural log of one over the partial pressure of the oxygen is equivalent to the positive natural log of the oxygen partial pressure. the “A” term corresponds to the temperature-independent standard enthalpy of formation (ΔHo) and the “B” term corresponds to the negative of the temperature independent standard entropy change of the reaction, namely (- ΔSo). For our hypothetical metal oxidation reaction, the free energy of formation is plotted as a function of absolute temperature. This is a simplified representation of an Ellingham Diagram. Ellingham’s ΔGo(T) equation is clearly in slope-intercept form (Y = mx + b), so the “A” term is the intercept, which means that the intercept of the line with the T = 0 K axis corresponds to ΔHo, the standard enthalpy of the reaction. Since the “B” term is the slope of the line, ΔSo is the negative of the slope of the line. 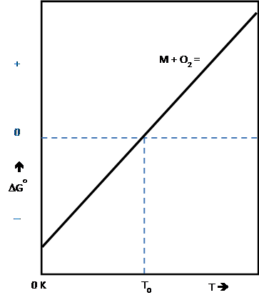 For oxidation reactions represented in Ellingham diagrams, 1 mole of oxygen gas is used up in the reaction to produce a solid oxide, so the change in entropy for the reaction is negative and the slope of the line is positive. The point at which the line representing the metal oxidation reaction crosses the line where ΔGo = 0 corresponds to the temperature T0 on the graph. Since at T0, ΔGo = 0, the natural log of the oxygen partial pressure is zero, so the partial pressure of oxygen is one. Now if the temperature is lowered to some T that is less than T0, then ΔGo(T) for the oxidation reaction is negative, the metal oxide is more stable than the metal and oxygen gas at 1 atmosphere and at that temperature the metal will spontaneously oxidize. Since the value of O2 is calculated from the equation ΔGo(T) = RT ln O2, at the temperature T < T0 , ΔGo is negative so the oxygen partial pressure is less than 1. Conversely, if the temperature is raised so that it is above T0, then ΔGo(T) positive, the metal is more stable than the metal oxide, so that any metal oxide would be reduced and the partial pressure of oxygen is greater than 1. The main take away here is that the value of ΔGo(T) for an oxidation reaction is a measure of the chemical affinity of the metal for oxygen, the more negative the free energy of formation at any temperature, the more stable the oxide. The Ellingham diagram is a simple, graphical representation of this important and very useful concept. This is one of the original diagrams, in this case for metal oxides, which Ellingham published in his seminal 1944 paper. Of course, he did not refer to it as an “Ellingham Diagram,” that moniker was ascribed by subsequent investigators who appreciated the importance of his work. Ellingham plotted the experimentally determined standard free energy of formation for various oxidation and sulfidation reactions relevant to the extraction of metals from their ores, as a function of temperature, using one mole of oxygen (or disulfur) gas in the reaction. A few years later, Richardson and Jeffes extended Ellingham’s work to the next level. They developed a clever nomographic scale that can be used with the Ellingham diagram to directly determine the equilibrium partial pressure of oxygen for a given oxidation reaction at the processing temperature of interest. Richardson and Jeffes published their paper in 1948 and their work continues to be of great utility in the field of steel making. Armed with the thermodynamic principles underlying how a basic Ellingham diagram for a hypothetical metal oxidation reaction is generated, we are ready to move on to the practical application of the Ellingham diagram for the oxides and some examples of how it is applied. We will do this in the second part of this article. Stay tuned for more on the utility of the Ellingham diagram.